Very artsy fartsy. In that good way. I have decided to go against my serial gaming nature and play the field a bit. Mass Effect: Andromeda was all I could play/think about and consumed all of my gaming time and energy. Right now I have several, small interests in some older titles and instead of committing to just one have decided to go where my mood fits me at that gaming time. The Division is my third person shooting itch, and Guild Wars 2, freshly loaded this morning, is my MMO itch. I am going in lightly and starting fresh. I last played over three years ago and played a Guardian to level 37. 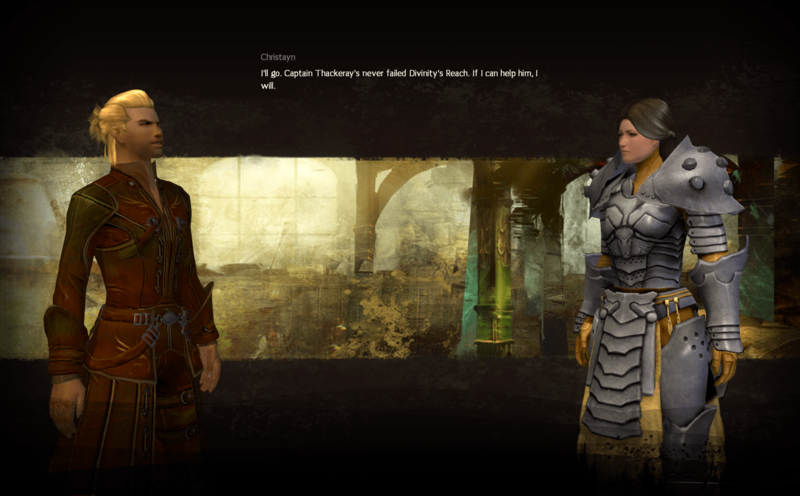 I really wanted to play a Mesmer back then (thematically) but wasn’t doing very will with it. Hopefully it is better balanced and I can do fine as a fresh character. 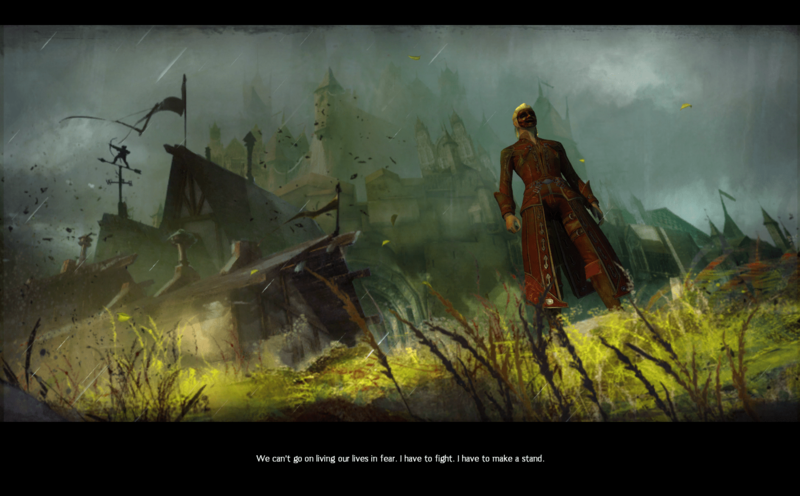 I do love the art style of Guild Wars 2. I didn’t play the original Guild Wars and even trying to recall my prior experience with which Guilds are at War. I don’t remember that being a central theme at all come to think of it. I am sure it isn’t that important. I remember my gripes being pretty minor and maybe even petty (to a degree, of course) of the way weapons and skills worked in the game. Either way, time for a fresh start. Logging into a new character gave me several rewards that I have no clue are exactly for or what I can use them with, but that is normal for returning to a game after many years. Even if I don’t remember what they are for I am certain they are valuable / useful. I did get a costume right off the bat which was a bit over the top to put on, but hey, I look like a city guard! The things were appreciated and I am sure I will sort out what to do with them all in time. This is one of Bhagpuss’s favourite games and I love visiting his blog and reading about his adventures so going to give this the good old college try. What is nice about MMOs is that the base familarity of them all are vanilla enough that you pretty much can find and correct all of your issues based on prior knowledge. A simple example of this is that my mouse was inverted at the get-go (which I dislike) but of course that is a quick visit to settings and a checkbox. The options were not under the picture of the mouse (which was keybinds) but simple enough to find while looking around. I believe that familiarity is helpful for all MMOs when you start. It’s like driving a car – they all look and feel different, but in the end they basically work the same fundamentally. I was surprised with the number of people in the starting area – especially during a workday, before lunch (I swear I was just testing to see if the install worked, IT snooping guy!) There were probably a dozen or so new characters running around. I was impressed for such an old game.I do also like the cinematic chats in the quests which is a nice bridge from pure text reading. I am off to the races in GW2 again and am looking forward to better exploring this game. With no subscription fee, and no hard end goals to race to (besides level, learn class, have fun) I can dip in and out and try to find the magic this game has to offer. 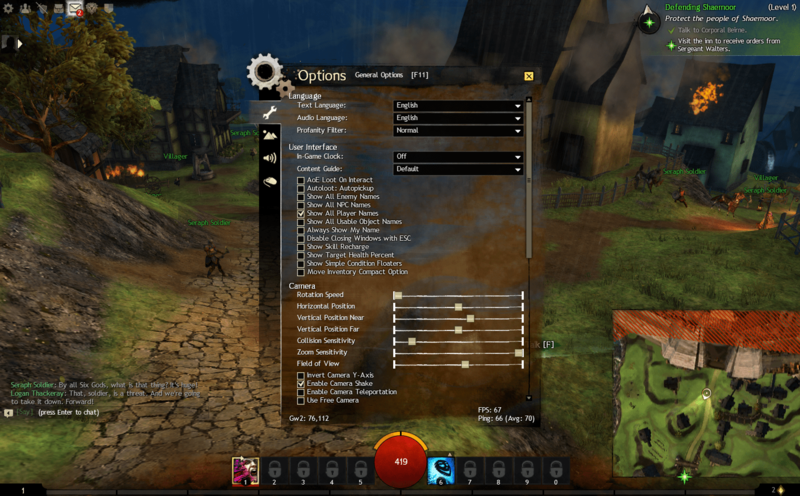 To the GW2 fans out there – any starter tips to enhance my enjoyment? Welcome back! The whole game is pretty busy but the 1-15 maps tend to be buzzing all the time. I guess that’s the F2P influence. I’d say take it at your own pace, roam around, try different classes, visit different maps. I know that’s how I play most MMOs but I think GW2 was designed to be played that way and one of the main things that causes people to get stuck is trying to find a set path to follow. You don’t have to complete the maps in order, or even at all. I still don’t have map completion on a single character after five years, although I admit that’s not normal. There have been so many changes since you last played, particularly to the way leveling works. Just about everything is locked to certain levels although some is soft-locked, in that if you know its there you can go do it at any level – it’s just that the game doesn’t tell you its there until it thinks you’re ready. They went through several versions, some of which were very unpopular, but I think the current leveling system is okay. Mesmer is a very powerful class but infamously restrictive at low levels, when you get barely any interesting abilities. Leveling is pretty quick, though, so stick with it. Gear makes a big difference as in most MMOs but there’s not much point getting obsessed with it until you get to 80 – I tend to wear whatever I find while I’m leveling although that does make you look like your got dressed in the dark from a recycling bin. Anyway, as you say, all these games are fundamentally the same – I’m sure you’ll get the hang of it! I’d recommend going with traits that enhance your phantasms – the illusions that wield weapons and do actual damage. Despite the fact that your shatters are pretty much your profession-defining abilities, their use is somewhat more advanced and I wouldn’t recommend a clone-shredding build focused around Deceptive Evasion if you’re emphasizing exploration and story over challenge. Phantasmal Swordsman/Duelist, Signet of Ether, Phantasmal Swordsman/Duelist, swap to greatsword, Phantasmal Berserker, and ranged attack away until you learn your enemies’ attack animations. Once you’ve got that down, you can run in and melee with sword while dodging, Sword 2 (Blurred Frenzy), Sword 4 (Riposte), and/or Pistol 5 (Magic Bullet) when they’re about to connect with an attack. Greatsword 243 is a nice damage combination if you’re feeling frisky. In terms of leveling up, run around and complete whatever you encounter on the map. That’s it. Just make sure your level is high enough for the map you’re on. You don’t even need to stay within the level ranges – you can go to other races’ areas and do their starter zones as well. You might even like things better that way. It might actually make the experience more enjoyable on Mesmer because they don’t really start to shine until you have access to all of your traits (usually somewhere around level 80) – in truth, they’re at their best when they become Chronomancers and start using a shield, wells, and Alacrity that sets everyone on purple fire. On your way to becoming a fabulous pyromaniac, you’ll have to settle for purple butterflies. Have fun! Yes on the screenshots, for sure. It’s a beautiful world. And I actually like the purple butterflies, such a fun and interesting way to explode a version of yourself. Also – thank you so much for the tips I’ll definitely use those. Very helpful comment here, thanks! !